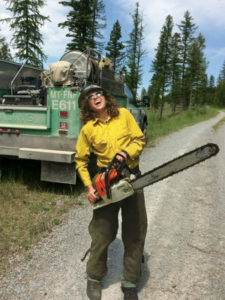 Wearing protective gear and wielding a chainsaw and shovel, Lily Clarke helped fight wildfires in Bigfork, Montana last summer on the Swan Lake District crew. She dug perimeter trenches around forest fires, cut down trees and removed burning logs, raked over hot spots, and conducted prescribed burns. As a young girl growing up in Montana, Clarke watched fires scorch the landscape each summer. She wanted to understand the decisions firefighters make on the ground—when to fight a fire and when to let it burn. For Clarke, a former cross-country runner, her stamina was never in question. Clarke is a 2015 graduate of Lewis & Clark College. She began research on the life cycle of morel mushrooms, which rise up through the ashes of forest fires, after receiving Lewis & Clark’s President’s Scholarship for Student Engagement. She’s held prestigious research positions with Harvard Forest and the Smithsonian Institute, worked as a guest scientist for the Helmholtz Centre for Environmental Research in Germany, traveled to Nepal on a Fulbright Research Scholarship, and worked as a photojournalist for the Wilderness Society. When it came time to choose a college, she headed to Lewis & Clark based on “a healthy financial aid package” and its “prestigious science programs known for promoting interdisciplinary learning.” Clarke originally wanted to be a doctor, so she took premed courses and also studied ecology. “I was a biology major, but Lewis & Clark didn’t force me to choose just one focus.” She also dabbled in anthropology, poetry, music, and French. She was looking for an independent research project when Assistant Professor of Biology Peter Kennedy gave her a USDA book on morel mushrooms. Her subsequent research on the mycorrhizal properties of morels earned her a President’s Scholarship during her sophomore year. Mycorrhizal fungi form associations with plant roots that can be beneficial to both the plant and fungi. When Kennedy left the college, Assistant Professor of Biology Margaret Metz became her advisor and helped direct her research. This article was written by Pattie Pace and originally published in the Winter 2019 issue of Lewis & Clark’s The Chronicle Magazine. It has been republished here with permission.